Apartmani Rašan – Malinska – apartment 50 m from the beach…. apartment 50 m from the beach…. First , let us welcome You to our web page ,where we wish to tell you a little bit about our apartments and the town of Malinska,and of course the island Krk. If you have any further questions , or we were not clear about something ,please contact us by email or phone. 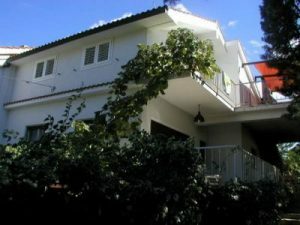 Apartments Rašan are located only 80 meters from the beach,which makes them very attractive. They are surrounded by greenery ,fresh air and have a beautiful view of the island Cres. The center of the city Malinska is only a 10 minute walk by the beautiful sea shore. Of course if You are not a walking enthusiast You can always drive there. In our offer we have two apartmants,which we try to improve and accommodate to our guests wishes every year. If you should need anything, your pleasant host is always there for you. The local store is about 150 metars distance from the apartment, but if You wish to make a bigger shopping then you must go to the city center. If you want to completely relax and come to a place where you will feel just like home, search no further you have found us.